The good news of God’s grace is meant to be shared. 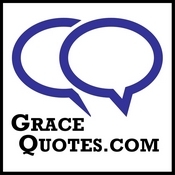 If you would like to have a GraceQuotes.com blog button on your own website or blog, you can copy and paste the html code that you see below. Tip for WordPress bloggers: Go to Widgets (listed under Appearance on your Dashboard), drag a text widget to your sidebar, then paste the html code into a text widget.